Project 541 is an organization committed to supporting and empowering girls and women in La Moskitia, Honduras, a remote region where resources are limited. Established in 2013 by our Executive Director, Kayla Austin, Project 541 began operating programs in May 2014. 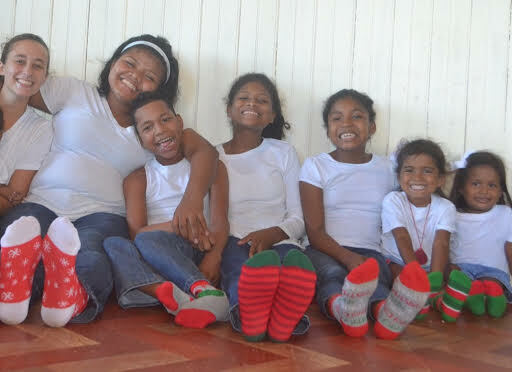 Kayla graduated with a Bachelor's degree in Nonprofit Management in April 2014, and now resides in Puerto Lempira directing the residential home and young women outreach mentoring program. As we continue to expand and grow we anticipate working with an increasing number of girls and young women each year, and look forward to partnering with them in order to improve the well being of the entire Miskito community. We currently have 8 residents in our residential program ranging in age from 18 months- 17 years. Five of our residents attend 2 different private schools in Puerto Lempira. We are currently renting a 3 bedroom house as our residential facility. We have purchased land and constructed a sea wall to protect the land. We hope to build a permanent residential facility on this land within the next five years for our family to call home. Our director, Kayla Austin, is the girls soccer coach at a local private middle school, Instituto Vida Abundante. She coaches 2 teams of about 20 girls each, training and mentoring them 3 times a week. As part of our outreach mentoring program to young women, Kayla Austin teaches English at Instituto Vida Abundate for 7th and 8th grade students. This allows her opportunity to reach girls that are not part of the residential program. ​Why the name Project 541 ? We would love to come and s﻿peak to your gro﻿up. Please contact us for a date a﻿nd ti﻿me.